Lost amidst the Alt-Media hysteria about the supposedly imminent commencement of World War III is the fact that any potential Russian military response to the US would show the world whether the S-400s can really stop Washington’s missiles, a “proof of concept” that neither Great Power might be willing to risk at this time and the fear of which might allow their present standoff in Syria to be “stably managed” in a relative sense. There are a lot of fast-moving events happening right now surrounding the latest Syrian Crisis, and it’s not the point of this article to review them all in detail, which is why the author recommends that the reader check out his previous analysis about “The Suspicious Timing Of The Latest Provocations In Syria” and his follow-up Facebook post from this morning about why the Alt-Media-driven hype about World War III is totally misplaced. The US-Russian standoff has rhetorically escalated to the point where both Great Powers have to do something otherwise they’ll “lose face” and subsequent “prestige”, which is why the US looks ready to hit Syria while Russia may very well militarily respond, but neither of these actions are guaranteed to be “substantial” and could very likely just be “superficial” in order to keep their delicate “dance” going. The US knows that endangering the lives of Russian servicemen would automatically trigger the tripwire that would necessitate Moscow undertaking a decisive military response, hence why this probably won’t happen and the so-called “deconfliction mechanisms” will be relied upon instead to prevent this “dark scenario” from materializing. By the same token, Russia knows that shooting down the US missiles will enrage Trump and prompt his “deep state” to push him into escalating the crisis even further in order to avoid “embarrassment”, which is one argument as to why it might not militarily respond to this predictably forthcoming assault apart from the fact that it officially declared last year after the first one happened that it wouldn’t do if any new ones happened either. That said, the Russian rhetoric on this matter has gotten to such a point – and been so widely misinterpreted by many – that there are very real expectations around the world for it to respond in one form or another otherwise it will be “humiliated” and considered “unreliable”, and this soft power-“constructivist” impression might actually end up influencing policy at the end of the day. However, it doesn’t mean that Russia will intercept Trump and his allies’ cruise missiles with S-400 ones but just that it could react through diplomatic or economic means like Russian State Duma Defense Committee Chairman and former Commander-in-Chief of the Russian Airborne Troops Vladimir Shamanov warned earlier this week. Russia is also in a predicament when it comes to its possible response because anything less than a 100% success rate with the S-400s might diminish their hard-earned international reputation as the world’s best anti-air and anti-missile defensive weapons system, something that Moscow might not be willing to risk when considering that billions upon billions of dollars of future revenue is dependent on their sales, which become even more important in the context of existing sanctions. Because of the dangerous escalatory risk that could occur if Russia’s S-400s take down all of Trump and his allies’ incoming munitions (something that Moscow said last year it wouldn’t do anyway), as well as the need to avoid any unexpected “flukes” that could result in anything less than a 100% or other similarly “convincing” showing of this defensive system’s first-ever battle-tested capabilities, Russia is unlikely to militarily respond to the US in any “significant” way. Nor, for that matter, is the US expected to “significantly” change the balance of power in Syria through its supposedly imminent and potentially multilateral strike against the Arab Republic, meaning that both the US’ actions and Russia’s reaction will probably be “superficial” in order for both sides to “save face” and not risk having the other “embarrass” them by upstaging their real military capabilities. Russia’s 100% deflection of the US and its allies’ best missiles would prove that the S-400 is the most effective system for preventing American-led aggression against any country in the world; conversely, anything less than that or similarly “unconvincing” (and brought about by some kind of unexpected and unusual occurrence) would make the world think whether rightly or wrongly that the S-400 doesn’t live up to its “hype” and is incapable of “saving” its customers. 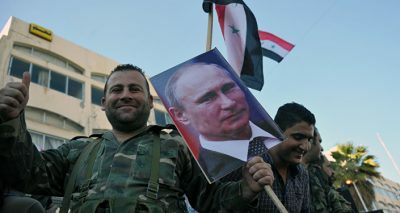 Therefore, as paradoxical as it may sound, the US-Russian standoff in Syria might actually be “stably” managed (key word, used relatively) precisely because of the military competition between these parties’ offensive and defensive weapons respectively, with each of them knowing full well that anything other than an “ideal” performance by either of them – which is impossible for both sides to pull off given that they’d be challenging one another – would lead to a profound erosion of their soft power, which is a risk that neither of them might be willing to take. Featured image is from Sputnik International.